Senators reconvened Jan. 13 to introduce new bills. 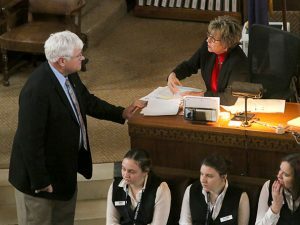 Sen. Mike Groene submits a new bill. LB429, sponsored by Lincoln Sen. Anna Wishart, which would provide for virtual net metering. New bills may be introduced for the first 10 legislative days, or until Jan. 18. Committee hearings are scheduled to begin when the Legislature reconvenes Jan. 17. Hearing schedules can be found at NebraskaLegislature.gov.